Product prices and availability are accurate as of 2019-04-21 21:34:58 UTC and are subject to change. Any price and availability information displayed on http://www.amazon.co.uk/ at the time of purchase will apply to the purchase of this product. Another amazing design courtesy of the guys at ControllerModz! ControllerModz pride themselves in using only the highest quality automotive-style methods to produce a finish that will look as good in the future as they do now. 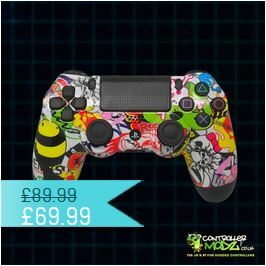 They also allow you to customize the controller with your own choice of buttons and thumbsticks, with over a 1000 possible colour combinations. Controllermodz also provide a swift dispatch service at no extra charge, because unlike the majority of their rivals, 99% of shells and buttons are in stock at the time of purchase which means waiting no more than a few days to receive your customized controller! You can also add a Controller Modz exclusive modchip that offers amazing features like rapid fire, drop shot and quick scope from just £7.99!